When you’re looking for flooring for trade shows or expo booths, rollable carpet is a great choice. 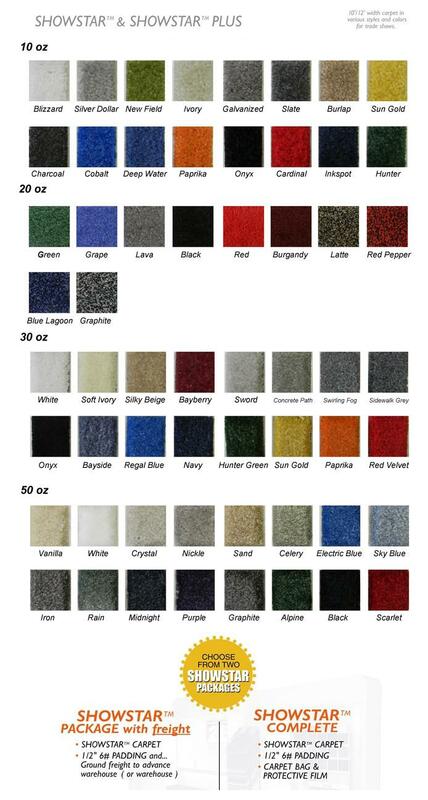 This soft carpet is made of EVA closed cell foam rubber, making it lightweight and portable. There are several benefits to using this type of carpet in your booth. It doesn’t take much space as it can be stored in a 10’ x 10’ box it ships in. Also, it is easy to install and allows you the flexibility of easily changing your booth size by buying more if needed. This eco-friendly top-quality flooring is durable and comfortable, two benefits for using this at your booth. It also works well in retail shops, hotels, stores, garages, basements and car workshops. This carpet is sold by the square foot, meaning you only buy what you need. There’s no waste here! Choose from two packages, one with padding and another with a bag to store the carpet and with a protective film too. We offer a variety of options ranging from 10 ounces to 50 ounces, depending on the thickness you’re looking for. There’s a multitude of colors making it easy to match your rollable carpet with your existing exhibition marketing booth elements such as banner stands. Designed with you in mind, rollable carpet is convenient for those going to countless conferences. It is also easy to store and doesn’t take up much room. Best of all, it is easy to lay out and also to clean. It works well for heavy traffic areas and provides comfort when it is needed most. For more information on rollable carpet and what colors and styles we have available, contact our professional team at Capital Exhibits today!